Since the MR2 Spyder is going to be doing a little track duty in the near future, it was damn near mandatory that it receive some love in the braking department. The MR2 Spyder (aka MR-S, aka MkIII) is renown for its stock brakes capabilities, hugely attributable to its light weight and rear weight bias. That, however, doesn’t get past the most common issue that street cars face on the track; brakes overheating, which leads to fade. I experienced it in my M Coupe, which arguably is much better suited for track duty with stock cooling ducts and other factory performance features. So, I hit the interwebs in search for a good set of pads for DE usage. The Carbotech XP8s came back with several recommendations, sounding rather comparable to PFC‘s 08′s (had Performance Friction produced pads for the MR2, I would have gone that route.) I also picked up some Centric rotors, as my EBC UBR rotors looked terrible, all the slots were full of pad deposit. I decided to stick with blanks this time. 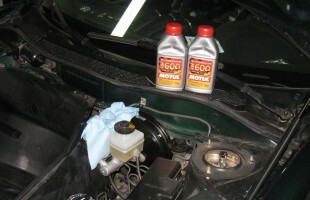 For fluid I originally filled the car with ATE Super Blue, because I had lots of it and it’s inexpensive. But after several track days of having fade with the ATE, I decided to ditch it and go with some Motul 600 that I also had laying around. 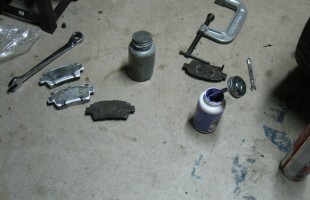 Since the higher heat also affects things like anti-squeal grease, I also went with some ultra-high temp Permatex ceramic grease, which is thick and purple. The hub faces also got a little coat of anti-seize to prevent any stuck rotor situation. 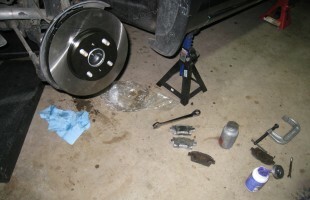 I have to mention that the Toyota brakes are much more of a pain to replace pads on than the BMW, surprised right? 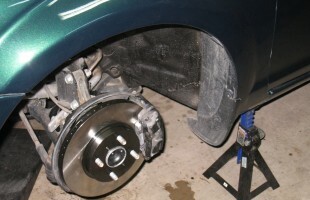 On a side note, I would have had this job done much sooner, had I not mistakenly ordered the wrong rear (5 lug) rotors!